They said it would be life-changing. I didn't believe them. Looking back on the months that have passed since I attended Jubilee, I still wonder at how much this one short weekend has shaped my life for all the weeks to follow it. Jubilee sparked a change in my heart that, little by little, has been transforming me ever since. The truth is, I used to say that I wasn't quite sure what I wanted to do with my life. Now, the only thing I want to do with my life is to hand it over to God so that He can do with it what He wants. I think we all—not just college students, but especially us—struggle with confusion over our futures, our plans. We wonder if the major we are studying or the job we are applying for is really what we should be doing. To be quite honest, it can feel as if we are running full speed ahead with no idea of our destination, or even why we are running at all. Sometimes, we wonder despairingly, if this is it. Here's the secret that I have come to understand since Jubilee: we need to stop looking at it as what we are doing with our lives and start seeing it as what God is doing through our lives. Being a Christian doesn't mean having it all together or always knowing what to do, but rather about accepting that we don't know, that we don't have it all together, but God is using that for His purpose. In recognizing this, we may find God in places we never thought to search before. For me, that place was Peru. This summer, I completed an internship in Cusco, brushing up on my Spanish-speaking skills while gaining real-life experience in public relations and tourism. Before I left, people often asked me if this was a mission trip or if I had any religious reasons for going. Though my program was not in any way related to church or faith, I still felt compelled to reply "yes" to this question. I think that is because, though I wasn't going for a religious purpose, I still felt called by God to complete this particular program. For some unexplainable reason, despite every risk and fear that I or my family had, I knew that I was supposed to go to Peru. With every new piece that fell into place, every sign told me that God had some purpose for me there. This suspicion was confirmed one evening when I had the chance to attend a service at a local Evangelical church. In a small modest room, located on one of the busiest streets of one of the most dangerous parts of the city, we came together, singing worship songs and shouting to God in what were, to me, foreign tongues. Though the message was delivered in Spanish and I fought hard to understand, the speaker's passion and God's own spirit moved me that night, proving that even in another language, God could still reach me, and I felt an overwhelming sense that I was exactly where I needed to be. I think life is like this sometimes. Even when we're not in a foreign country thousands of miles away from home, we can still feel out of place, unsure about where we are, and uncertain about what we are doing or why. But then, in the least likely places, at the most inopportune times, God has this way of gracing us with His presence, His peace, His truth. And it wasn’t just in this small church that I felt Him with me. It was every time that I blundered through Spanish on days when my brain just wouldn’t quite connect to the conjugations I learned years ago—when I felt inadequate and unable, an ever-present voice whispered that I was enough and lent me the strength to keep pushing on. It was while cautiously navigating a crowded city and foreign environment that I felt God’s hand guiding me along, easing my fears. And it was when my lungs were burning and my legs screaming from exertion as I climbed Machu Picchu Mountain that I was in awe of God’s beautiful creation in the magnificent view that awaited me at the top. Maybe it is easier for me to look back on that trip in hindsight and see God’s hand working out all the little details. As I sit and reflect months later, back in my cozy little life, it is all so clear how much He blessed me with this experience. But if I am being totally honest with myself, I could say the same thing about all the other normal, everyday moments, too. I didn’t need to go thousands of miles away to see God moving in my life; if I just look a little closer, I would see that He is working things out every single day. This is the most important lesson I learned from my summer in Peru and from Jubilee: the Christian life is about recognizing that God is a part of everything that I do and everything that I am, and only because of that realization am I able to see Him in every part of my life. —Vanessa Restifo first attended Jubilee a year ago, when she was a freshman at Westminster College in Pennsylvania. 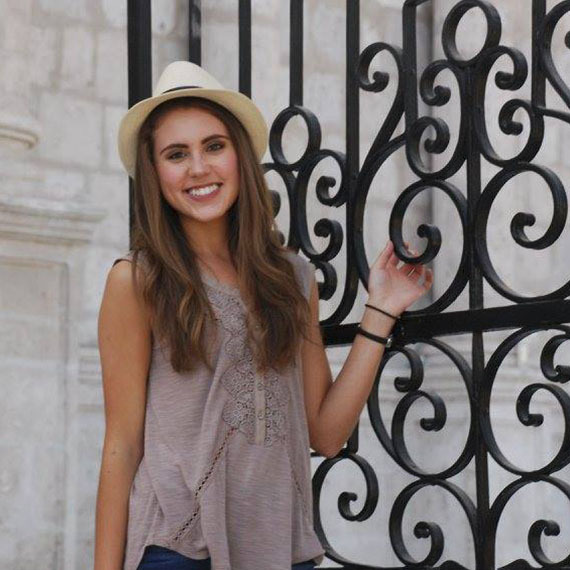 She is now a sophomore at Westminster, studying Public Relations and Spanish.